Angler has great success around platform legs. Are you crazy? I mean, literally, are you crazy? So crazy that you’d dive 70 feet down in shark-infested waters with no air tank just to shoot a fish? Capt. Louis “Butchy” Thornton is. He does it every year at this time. The fishing this summer has gotten rolling a bit later than usual, but it’s in full swing now. Thornton and his buddies have been running to platforms scattered in nearshore and offshore waters out of Venice Marina to spear tripletails up to 20 pounds as well as mangrove snapper. The former fish is the target, but the latter is always around. Free-diving at the platforms ain’t for those with faint hearts or small lungs. Thornton has trained himself to hold his breath up to 80 seconds. That doesn’t sound like much, but try it. You’ll probably feel light-headed around the 30-second mark. Because of his confidence in his ability to slow his heart rate and limit his need for oxygen, Thornton will swim down to 70 feet if he thinks fish worth shooting are holding that deep. This year, however, he’s found the best action much closer to the surface. “Right now, you can shoot whatever you want at about 40 feet,” he said. 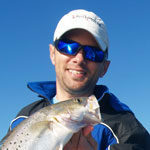 A licensed charter captain, Thornton takes above-water anglers out to catch fish at the platforms using rods and reels, but he limits the spear-fishing ventures to experienced divers only. 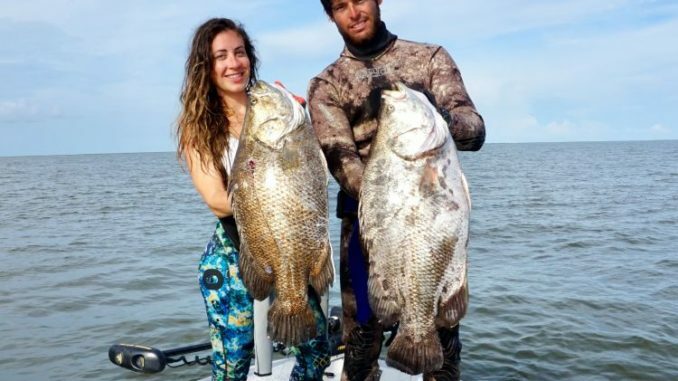 Last week, he hosted YouTube star Jacki Shea, who shot her first-ever tripletail on the trip. Shea’s tripletail weighed 15 pounds. That’s a nice fish, but Thornton invited her back to attempt to break the women’s free-diving record, which he said was around 20 pounds. Time is on her side. Thornton said the fish stick around until offshore waters really get chilly.